Because even the smallest piece of trash could change our ecosystem. Today, my dad sent me a few links of photographer, Chris Jordan's work. Jordan has been documenting the world and it's irresponsible and over-indulging aftermath in traveling exhibitions depicting global mass consumption and pollution. 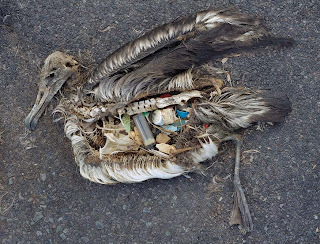 In the past decade, Jordan has captured the destruction of Hurricane Katrina and chronicled the outcome of many albatross chicks throughout Midway Atoll. Maybe we will think twice about what we eat and where we leave our garbage if we catch a closer glimpse at the damage that our cultures are capable of creating. An unaltered image of a baby albatross on Midway Atoll. Photograph by Chris Jordan. It's a shame how much people take things for granted!! This is a really, really incredible photo as well.